"Deflecting attacks doesn't require any specialised training!" I did something the other day that I normally don't do: I was enticed to go onto one of the big forums where, it seems, they were discussing one of my articles. All I can say is, I realised after a few minutes why I don't frequent forums any more. Despite my own promises I couldn't resist replying to one train of thought by a certain "rne02" who raised that old chestnut: "There are no blocks!". I've dealt with that subject exhaustively and if you haven't read my article on the subject, then I encourage you to do so here. I'm saying you're not really using the Uke. You are essentially just parrying with a tiny rotator cuff movement and body shift online and telling yourself that because you have done something that resembles the tail end of the Uke technique, you have done the Uke. Whether big or small, with the exception of Ude Uke (which at its tail end resembles a closed hand flinching/pushing parrying motion), Karate Uke techniques do not work as deflections against fast unpredictable attacks launched at a realistic range. But against any form of fast unpredictable attack, if you think that you are doing Age Uke or Uchi Uke or Gedan Barai to deflect (as opposed to naturally slipping and parrying and swatting like any untrained person) then you are kidding yourself. The idea that uke techniques are ‘blocks’ and that their predominance in kata reflects the defensive nature of karate should be rejected for a number of reasons. Firstly, deflecting and blocking attack is a largely instinctive action that does not require specialised movement. 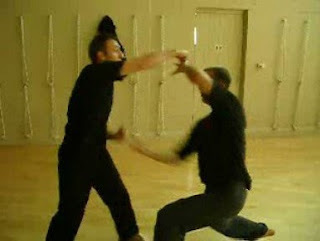 If you observe anyone shielding themselves against a committed attack outside of set prearranged sparring combinations, you will see them cover, parry, slap, duck or flinch (or any combination of those), and any time you see anything resembling a fixed uke technique it will be because the uke technique itself mimics natural movement. Secondly the best form of defence is offence, and that principle has been enshrined in martial writings across many cultures for centuries. A committed attack is not stopped by continuous deflection but by pattern disrupting behaviour that forces reaction and reorientation. Thirdly it is unlikely to be a coincidence that uke techniques function extremely well as striking, unbalancing, trapping and limb (and head) manipulation movements in stand up grappling. Finally it is incongruous that the majority of the movements being drilled should be devoted to something that requires little training: their being designed to navigate the most common problems posed by violent incidents makes far more sense. What? Deflections and parries don't require specialised movement? They require little training? They aren't "designed to nagivate the most common problems posed by violent incidents"? but does it in free sparring. I would have thought learning to deflect an attack (especially when there is an element of surprise) would be central to what civilian defence arts teach. Jwt's other point about "the best form of defence is offence" is something I've done to death (see "Attack, attack, attack" and the "Boards don't hit back" series) so I won't go into that. In my experience, the standard uke forms teach angles and planes of interception and deflection (among other things). When applied as deflections/parries, they are much "smaller" versions of the "formal" basic movements. I've been applying deflections against realistic attacks for more than 3 decades. I make them work reasonably well. I can't imagine having whatever level of skill I have now without learning traditional forms of uke (from karate and the Chinese arts). These have taught me how to "naturally slip and parry". Such skills aren't somehow "ingrained": they need to be learned and practised like any other skill. "Swatting like a beginner" is as far from the pinnacle of the art of deflection/parrying as is the ham-fisted, open chord strumming of a guitar by a beginner from the virtuoso playing of a musical instrument. Yes, we have an ingrained "flinch reflex" which comprises a retraction of the body and an extension of the arms to ward off danger. But the notion that this primitive reflex is optimal for a complex activity like self defence is, frankly, absurd. We might start with the flinch reflex. But we have to modify it so as to make the movement both effective and efficient. This requires grooving your body to respond along optimal angles and planes. So assuming that the angle and plane of a deflection/parry need to be taught, I can see precisely why it is prudent to "magnify" them for a student (especially a beginner) so they can be better examined, studied and understood. In other words, I can see why we might want to use some larger, more formal movements (ie. "uke") to teach deflection. The alternative is to persist with teaching the student some tiny circular/sliding movement (which is what applied uke actually become). Accordingly we use age, chudan, hiki, gedan - all to teach different, essential, principles of deflection/parrying: the different angles, planes, rotations of forearm, torque etc. We apply these principles in unscripted sparring from which the stills in the essay are taken. Yes, the deflections/parries are highly abbreviated forms of the basic uke. But nothing makes the connection between these abbreviated forms and the full, larger traditional form an "illusion". Traditional uke aren't "literal techniques": they teach principles of deflection - principles that have little or nothing to do with a beginner's "swatting". I note that the students who best understand the traditional deflections are the ones who routinely apply them effectively and efficiently (low impact, good deflection). The better they are, the less "swatting" you see. Sure, fighting is messy and nothing like basic form. But what makes these adjacent images anything other than an applied "traditional uke"? I wouldn't dispute that you can use uke for strikes/locks etc. But I don't understand why some feel they play no role in teaching students how to better "slip" and "parry" attacks - especially when the science of deflection is so complex (and when traditional uke contain so many compound movements that seem to correspond very neatly to the planes/angles you need to deflect/parry)? "Swatting like any untrained person" is very far from the pinnacle of martial arts deflection. Rather, it is just inefficient, ineffective form. 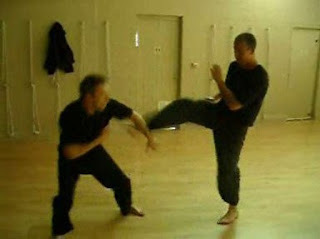 In my experience, an understanding a basic chudan uke in a formal setting lets you move to unscripted "slipping" and "parrying" (not "swatting") by absorbing the principle of the basic and with a much smaller, less "formal" movement. The training proceeds in a graduated way. We start by performing chudan uke "in the air" in a basic stance. Then we apply it against a formal, basic punch in the manner of the gif below. We groove it in that context until the student is able to slip the punch effortlessly (and with as little "telegraphing" or "feedback" to his partner as possible). Note that "hard blocks" are usually the result of nothing more than bad timing: there are very few instances where it isn't preferable to have a contact that is barely registered by your opponent as his or her punch is deflected. The more feedback you give (in the form of an impact) the less efficient your deflection has been (some force is being used in the "hard" contact) and the more "on notice" your opponent is that something is happening. relies on a great deal of training: it requires skill. Mostly, a good deflection is one where your opponent barely notices his or her arm has been contacted. That way the attack is deflected - and the counter is landed - before your opponent even realises what has happened. Too many people get caught up in "punishing" their opponent's attacking arm (something they default to as beginners) - then trying to justify this as some form of traditional "objective" - a beast people now call "hard blocks". But it is my view that, apart from mistakes and the odd exceptional use of a block to "punish" a limb for tactical purposes (where you don't want to hurt the person or something - who knows? 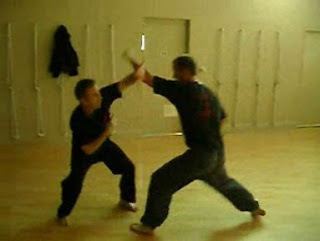 ), "hard blocks" don't exist as a traditional martial arts method. They are just "soft deflections done wrong". Okay, so you've grooved your soft deflection with a partner in basic standing or one step sparring. You think it's coming along nicely. Now it's time to start gradually adding realism. From there we move to slower, softer free sparring - where you get a chance to apply your techniques in a totally unscripted environment but where you won't feel like your head is going to be knocked off. It's a kind of 3/4 speed "play" (see from 2:45 onwards). From there we increase the pace and the intent to something a bit rougher. As messy as the fighting gets, the principles of interception/parrying are in constant evidence (even if "literal uke" aren't). Graduated training of this kind is how you get to build up to applying and using deflections/parries/blocks. What troubles me is not that some practitioners have yet to develop one of the most vital skills of traditional martial arts. Instead it troubles me that, rather than acquire these skills (or at least accept that they haven't developed them yet), they attempt to rewrite their art's foundations so as to deny the very existence of deflection as a skill that needs to be developed through hard work: of gong fu. Rather, any beginner's swatting is just as good.